This weekend I delved into the book section of the Saturday Wall Street Journal (a favorite activity) and discovered “The Image as Event,” Ann Landi’s review of Arden Reed’s book, Slow Art. Reed’s passion for “slow art” began with his repeated viewing of Edouard Manet’s “Young Lady in 1866” at New York’s Metropolitan Museum of Art. He defines “slow art” as “a prolonged encounter between object and observer.” He contrasts this activity with the average time an American museumgoer spends with any work of art—about 6 to 10 seconds. Reed also writes about “tableaux vivants,” which he describes as “living pictures” in which actors hold theatrical poses for 90 seconds or so, often as recreations of well-known masterpieces like Leonardo’s “Last Supper.” This art form gained popularity around 1760, waned in the 1910s, and seems to have regained steam around 1960. But before these modern-day examples of slow art presented themselves for viewers seeking (or just needing) an opportunity to slow down and have a serious encounter with art, early Christian icons “demanded slow looking and veneration from viewers.” Later, religious processions with floats featuring tableaux vivants acting out Biblical scenes appeared. Reed ties all these into a genre he calls slow art, taking us from Malevich to Serra, and even into the fiction writing of Don DeLillo. Another illustration of this genuine knowledge of paintings appears in The Peasants: as a finishing touch in describing a horrible old woman, “a hideous black parchment, endowed with movement” he adds, “her likeness is found only in David’s painting of the Sabine women,” which does indeed feature a wizened old woman as a second character. Balzac often gave fictional characters more credibility by using a known painter’s name. Not that I’m in his league, but I chose to do this with my novel Cherry Bomb (which releases in August) by having the well known abstract expressionist painter Elaine de Kooning appear as a major character, although I fictionalized much of her story in the book. I’m just now getting to the sections on Zola, Huysmans, Maupassant, and Proust, so this isn’t a complete book review. Just a preview. I can’t wait to see where these next four writers take me in their journey into the art world. I have a feeling I’ll be reading some of their novels soon…. Fascinating. Of course, for me the topic of visual art and literary art also brings to mind ekphrastic poetry, which can be descriptive but often is interpretative or developmental. 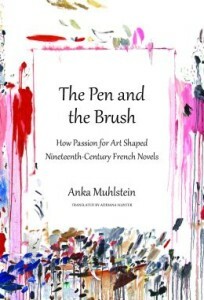 I also thought about ekphrastic poetry when I read parts of The Pen and the Brush, Joanne.